Schedule To Be Announced in the spring. All tournaments will be round robin, participants will play each other in a bracket, winner of each bracket will play each other in a playoff. Events will run either as one day or two days. Balls are provided. Play may start as early as 9am or 10am. See pics from tournaments, Napua's Garden, and other events at our photo gallery! 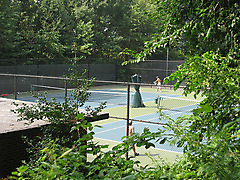 PLEASE VISIT THE NEW 119th St. Tennis Association Website. You've come to the right place to find association news, learn about upcoming events and tournaments, find new hitting partners, and learn about all of the benefits of membership. We have put together a section for people that are interested in joining. We hope to count you among our members in the 2019 season. Annual Membership Dues: $50. Pay by credit-card at our secure site — your support is needed to keep our courts properly maintained! Note: NYC Parks and Recreation Tennis Permits are required from Sunday, April 7 through Sunday, November 24, 2019. See the NYC Parks and Recreation website for further information and to renew online. Permits are sold at the Arsenal at 61st Street and 5th Avenue: Adults $100 ($90 with an IDNYC), Seniors $20, Juniors $10; Single Play passes $15 per person. First-time permit buyers must purchase their permit at the Arsenal, Paragon Sporting Goods (in mid-April) or by mail. Year-round rule: courts are signed for on a first-come, first-served basis. However, between April - November, a season permit or a Parks issued single play pass are required to reserve a court; one hour for singles, two-hours for doubles. Repeats allowed only if there is availability. If no attendant is on duty, sign-in sheets will be available outside the Park's Staff house; please respect the honor system! Court hours throughout the year are 8:00 a.m. - sundown. Courts only close when covered in snow. Please be advised that during the official tennis season, court attendants clean the courts between 6:00 a.m. - 8:00 a.m. We request your cooperation to briefly cease play while courts are maintained. This is for your safety as well as for general cleanliness needs! The 119TA is your advocate for city funding for repairs, and is an affiliate with Riverside Park Conservancy, the non-profit organization that restores, maintains and improves Riverside Park. Pressure washing of six courts and much needed crack repair on three courts was completed in July 2014. This work cost us $27,000 — all money raised from our membership and tournament fees, your generous donations and picnic raffles. We need to do more and are pleased that we are moving along on a grant from the State, procured through Assemblyman Danny O'Donnell. We expect work to be done in the 2019 season. While this may cause some court closures and inconvenience, we know it will be for a better experience at the courts. 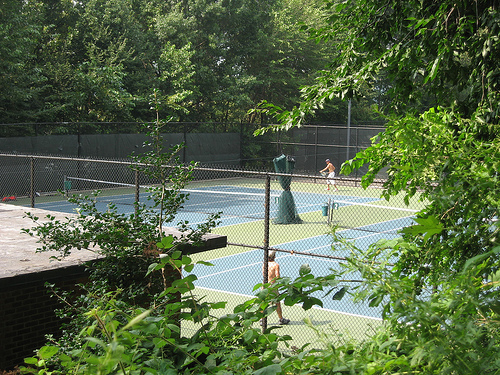 The 119th Street Tennis Association is pleased to be an affiliate of Riverside Park Conservancy.